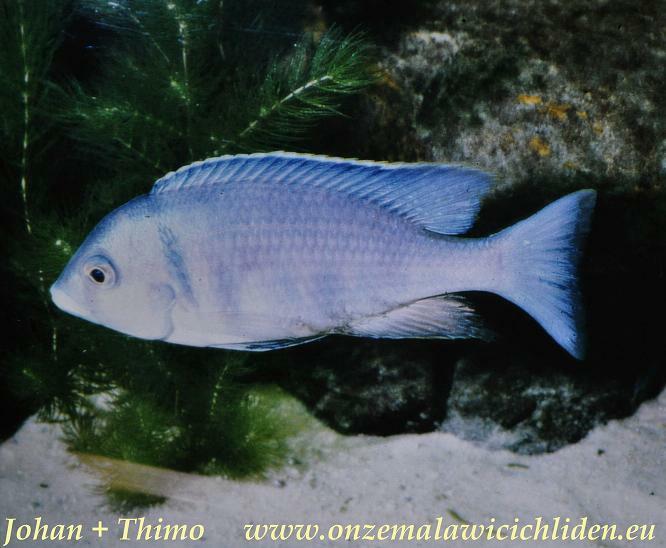 In the lake Placidochromis electra is living in intermediate zones from rocks to sand and above the sandbottom. In an aquarium there has to be enough space to swim for these fish and a decent amount of sand on the bottom. At that time I've had one male with three females of this species. The male in my aquarium was over 15 cm tall, the females were about 13 cm. I hold them together with Cyrtocara moorii in an 2 meters long aquarium but they couldn't live together. So I made the choice to continue with the "electra". Nowadays - a lot of years later - I've got "moorii" but when I see an "electra" I'm still fascinated of their beauty. "Electra" aren't particularly agressive against other fish. On the picture you see here is a male which I had in my aquarium. Unfortunately, this is the only picture I have of the examples which I have hold in my aquarium.